Is prison gerrymandering new to you? Welcome! We wrote our introduction to the site and its contents just for you. The national movement against prison gerrymandering began when the founders of the Prison Policy Initiative discovered that the sheer size of the prison population was combining with an outdated Census Bureau rule to seriously distort how political decisions are made in this country. In a series of reports about the 2000 Census, we put numbers on the problem of prison-based gerrymandering, suggested solutions, and sparked a national movement. 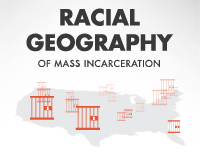 The prison miscount was a key part of the discussion about the 2010 Census, and the Census Bureau agreed to publish prison count data earlier than in the past, in order to assist states and counties with reallocating or removing incarcerated populations during the redistricting process. Two states, Maryland and New York, passed legislation to end prison-based gerrymandering and count incarcerated people at home for redistricting purposes, starting immediately. New York's law was upheld by the New York Supreme Court, and Maryland's law was upheld by the Supreme Court of the United States. Two more states, Delaware and California, passed similar legislation to end prison-based gerrymandering starting after the 2020 Census. Our research and organizing has led hundreds of county and municipal governments across the country to reject the Census Bureau’s prison counts and avoid prison-based gerrymandering. We led hundreds of civil rights, voting rights and criminal justice organizations and nearly 100,000 individuals to ask the Census Bureau to end prison gerrymandering before the 2020 Census. The clearest example of prison gerrymandering comes from the City of Anamosa, Iowa where a large prison was almost an entire city council district. Council districts are supposed to contain the same number of people, but basing districts on non-voting non-resident prison populations gives a handful of residents the same political power as thousands of residents elsewhere in the city.